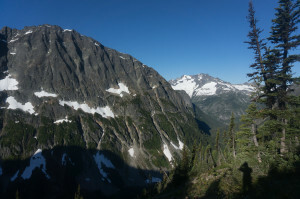 Logan, my last remaining North Cascades 9,000-foot peak, is buried deep in the wilderness south of highway 20. The standard southwest route, with its northern approach, requires nearly 20 soul-crushing miles of mostly forested trail. 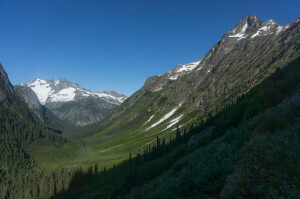 The Banded Glacier route I chose instead involves either 13 miles and 2,000 feet of gain via Thunder Creek, or 10 miles and 3,000 feet in both directions via Easy Pass. The alternatives are energetically similar, and while the former is probably faster, I chose the latter to save a bit of mileage on my knees. My 13h35 represents a fairly hard effort, but not a speed attempt, and includes some route-finding errors and about a half-hour on the summit. Knowing the route, I could probably manage something closer to 12 hours at full speed via Thunder Creek, but once is enough. I woke to my alarm at 4:00, but it was surprisingly cold outside my sleeping bag, so I went back to sleep for a bit. I was eventually reawakened by a mouse who had somehow climbed on top of my car, then decided that the best route to my pop-tarts from there was through the (closed) rear window next to my head. I slid into my puffy jacket, took my time with breakfast, and started up Easy Pass around 5:50. The northeast side of the pass is a consistent climb with good scenery, and the cool morning was actually pleasant once I was moving. 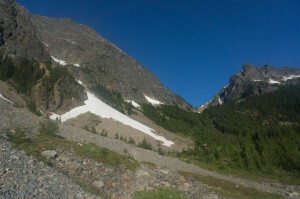 After meandering through relatively open woods, the trail crosses talus and heather, finally switchbacking through scree to a grassy saddle east of Mesahchie. Reaching the pass at 6,600 feet, I was rewarded with views of Fisher to the left, Mesahchie to the right and, ahead in the distance, the Logan massif with its various summits and glaciers. Descending to Fisher Creek, I received my first Cascades leg-soaking of the season, as the eager flowers and greenery did their best to overrun the underused trail. This section was only intermittently runnable, with the footing often either too rough or completely obscured at calf-level by overhanging grass. Once in the forest, the trail opened up, though frequent blow-downs continued to break the flow. I saw few signs of recent human traffic, though I did see several large piles of bear manure. I crossed the bridge over Fisher Creek, then consulted my map and GPS to locate the side-stream leading from the desired unnamed lake. The navigational aids are unnecessary: it’s a wide, rushing torrent with a bridge over its old, dry channel. 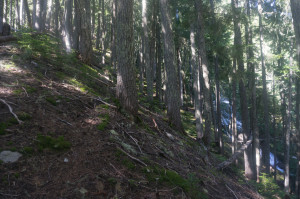 Following the faint ridge just left of the creek, I found the going steep but mostly painless at first. The last few hundred feet through cliff bands and shrubbery were slow, but not outrageous by Cascade standards. Nearing the lake — “good camping,” says Beckey — I entered a brushy bog serving as a major mosquito breeding facility. Unable to stop, think, or put on bug spray, I bashed my way across the outlet marsh, unleashing clouds of mosquitos every time I hit a branch, then scurried up talus right of the lake until I was above the swarm. In retrospect, this was a bad route to the wrong place. While I aimed for a grassy ramp leading near the toe of the ridge, Beckey’s “Christmas Tree Col” is actually a notch much closer to Thunder Peak, across the snowfields upstream from the lake. Determined not to return to mosquito hell, I third-classed my way through cliff bands and burrowed through vegetation until I reached my ramp, then followed a faint goat-trail to the ridge. Peering over the other side, I expected to see Logan and the Banded Glacier, but instead found only lower Logan Creek. Trusting in goat, I looked for fur and spoor, and soon found an impressively-steep goat path which led up the spine of the ridge, traversed around a subpeak, then descended to the large, partly-frozen lake at the Banded Glacier’s snout. While putting on my crampons for the climb, I heard telltale small rockfall, and spotted a trio of mountain goats headed toward the ridge above and to the left. 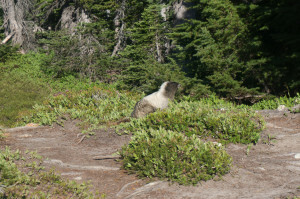 Figuring they knew the area better than I did, I decided to follow them on the return, and kept track of them as I climbed to the Douglas-Banded glacier col. 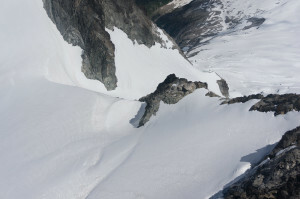 Though the Banded Glacier is steep and has crevasses, they are easy to avoid by going along the left-hand side. 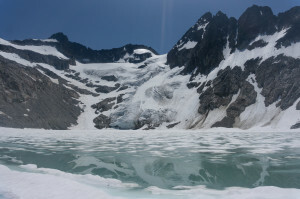 At the col, I got my first view of the larger Douglas Glacier and, beyond, Mount Goode towering over the North Fork of Bridge Creek. 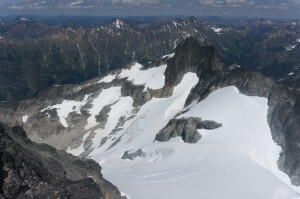 After a bit more snow, class 2-3 rock led to the narrow, north-south choss-ridge of the summit. 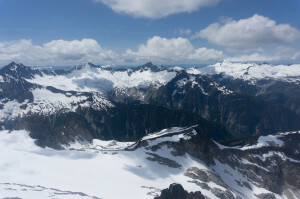 From this perch, the large Boston and Inspiration Glaciers are visible in their entirety to the west, Goode’s northeast face rises to the southeast, and Easy Pass looks deceptively close to the northeast. Finding a passable seat, I spent a leisurely half-hour enjoying my fish before the grim slog home. After downclimbing the upper glacier (too steep to boot-ski), I headed toward where I last saw the goats, hoping to find a “Christmas Tree Col” leading through the ridge north of Thunder. 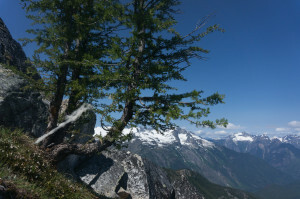 I initially found a cliff, then proceeded to an orange, chossy notch near the saddle, where I found a small, tree-shaped spire above a decidedly un-tree-shaped tree. The other side of the ridge looked treacherous on both sides of the “tree,” but I saw fresh goat-tracks below and, looking more closely, found fresh prints descending the perilous-looking muddy gully to the right. Carefully making my way down, I was impressed that the goats managed without ropes, axes, or opposable thumbs. 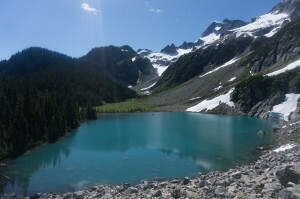 From there, I played (and won) a fun game of “don’t cliff out” though the snowfields to the upstream side of the lake, going around the right with minimal bog and mosquito trouble. I somehow botched the descent, taking a brushier line farther from the stream, but still came out almost exactly where I left the trail. All that remained was 10 miles and 3,000 feet of tedium. 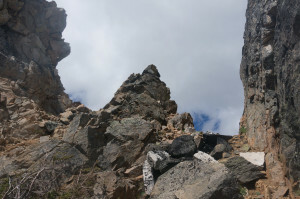 Though it was not obvious going up, the upper northeast side of Easy Pass is constructed of sharp rubble to minimize erosion and maximize frustration. This made much of it unrunnable, but I was still done well before dark, with plenty of time to relax, savor my tuna, and decide what to do next.